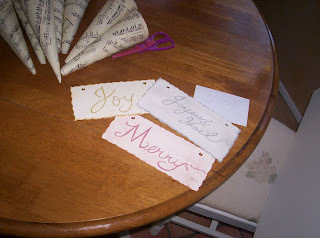 More Christmas, And Some Crafts! Hope you are all having a great Wednesday!! 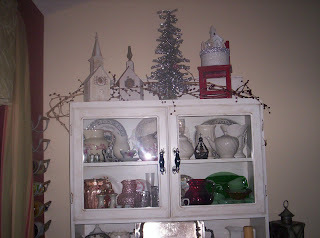 I thought you might like to see more of my Christmas decorating. 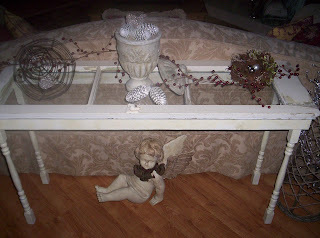 The top of my hutch and a little side sofa table. A couple of Birthday cards that my friend asked me to make for her sisters. All three of them were born in Dec. 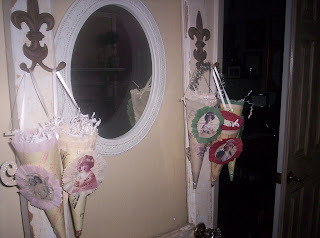 I have been busy making more cones. 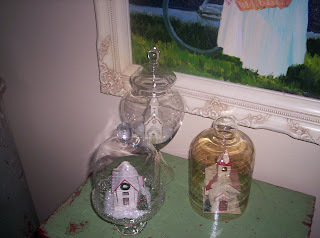 I put some of my little houses under glass this year. Hope your decorating is going well. Hope you all had a great Thanksgiving. Now that it's over we can concentrate on our holiday decorating. That is just what I have been doing. 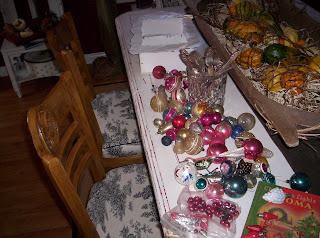 As of yesterday, the Thanksgiving/Fall decor went away, and out came Christmas!! 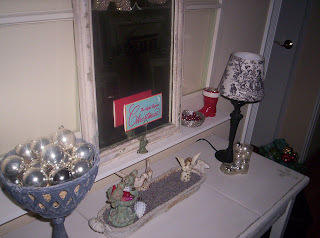 I think my next few posts will be sharing my Christmas decorations with you. I have a lot more to show you. I can't wait to see all of your decorations as well. I also wanted to let you know that it is getting closer to my 100 post. I will be having a little giveaway. Can't wait for that! Enjoy your Turkey Day leftovers!! 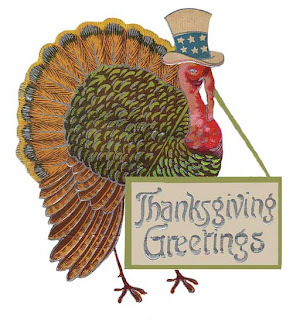 I hope you and your families have a wonderful, and Happy Thanksgiving!!! 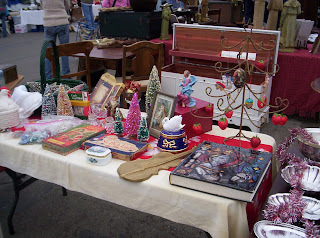 Flea Market Finds and Signs! As promised, here are my flea market finds from Sunday. 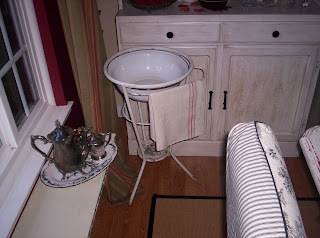 I got this pretty washstand from Jennifer Grey. 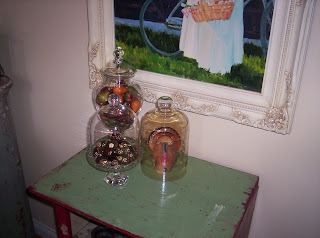 I am going to use it as an ice bucket for Thanksgiving. After that I have many ideas for its use. Maybe in the guest bath, or guest bedroom, or maybe outdoors. The Old window frame is in my bedroom for the time being. 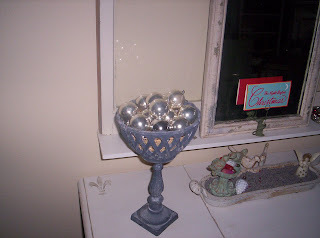 I think I will find a use for it in my Christmas decorating. 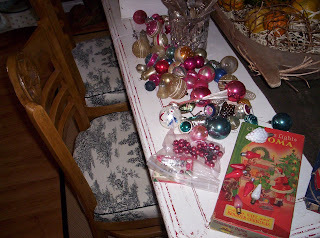 Here are all of the vintage ornaments that I picked up. They are so unique and pretty. They have so much more character than new ones. I love these old lights. The boxes are as pretty as the lights. Here are some views of Barbara's shop with my signs hanging in there. Her shop is amazing!!! 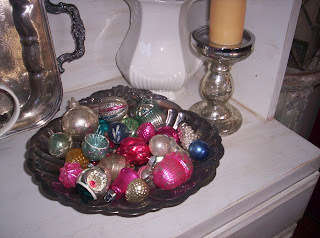 One more view of my ornaments. Hope you are all having a great Tuesday!! 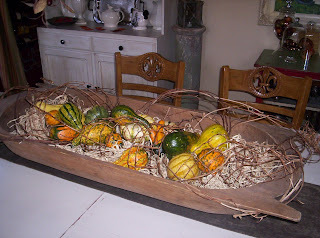 I am off to iron the tablecloth and napkins for Thanksgiving. 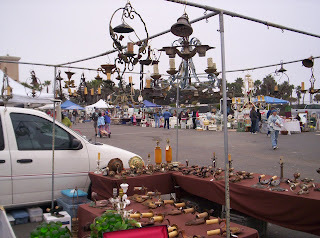 Sunday Morning at the Ventura Flea Market! As we awoke this Sunday morning, it was dark, gray and very foggy!! If you remember last month, it was warm, windy, and we were having horrific fires here in Southern California. 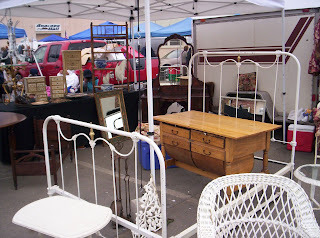 Here are a few shots from the Sunday, Ventura Flea Market. 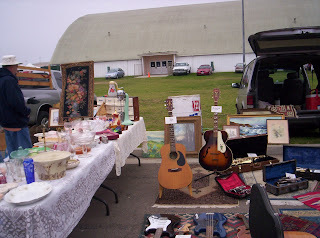 Now the booth with the guitars is what my husband Mark likes to look at. Me, not so much. I of course like all things girly. This is why we get along so well, he has his stuff and I have mine. 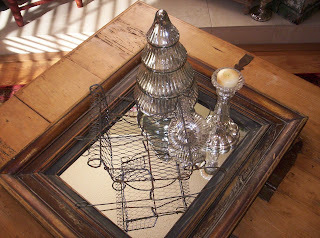 Love all the vintage light fixtures, and this iron bed was so pretty. 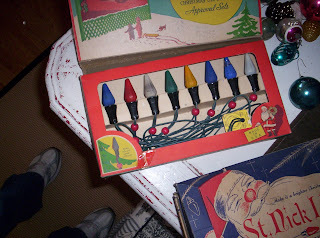 Besides the Christmas lights, I managed to buy 2 boxes of vintage ornaments for only $10. 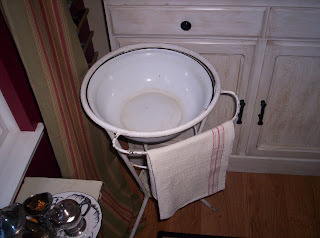 I bought a beautiful iron wash stand from Jennifer Gray (www.theoldpaintedcottage.com) I think I will be using it for Thanksgiving as a champagne bucket next to the table. 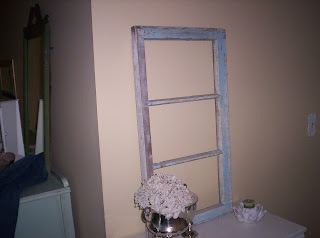 I also got a great shabby window frame, yet to be determined what to do with it. 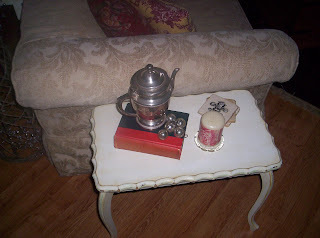 I think I will post my finds for you tomorrow, along with some shots I took at Garden Memories. I thought you might like to see some of my signs hanging in the shop. 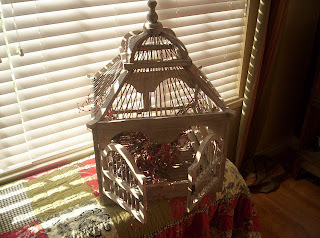 www.gardenmemoriesgifts.com. I am leaving on my morning walk, but I will be back tomorrow with the goods. Just wanted to visit with my blog friends for a few minutes. 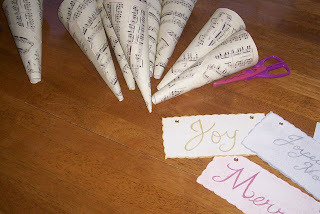 I have been very busy making signs, and cones. I am having such fun, but am very busy! I am excited to say that the signs have started selling at Garden Memories. Also I got a custom order from a fellow blogger. She was so sweet to ask if she could order signs from me. Yay!!! Visit Linda's blog sometime. 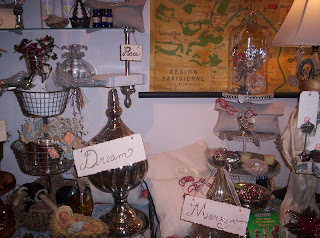 http://somewhereintyme.blogspot.com/ Very nice blog. 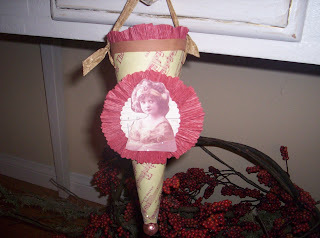 I am really enjoying making these cones. My friend Joan, (My walking buddy) helped me figure out how to do the sheet music in colors. So now I am having even more fun with the cones. As you can see in the picture, kind of a vintage muted red. 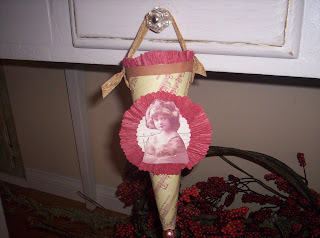 I used some vintage crepe paper, glitter and a vintage Christmas ball at the bottom. So I am going back to work/fun now. Hope you are all having a wonderful Friday!! 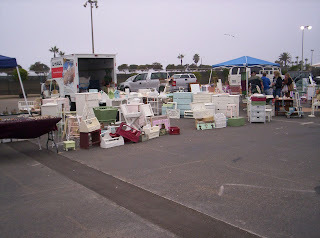 I am going to the Ventura Flea Market on Sunday. I hope to get you some good pictures. Don't forget to sign up for Jennifer's Holiday contest. Info on previous post. 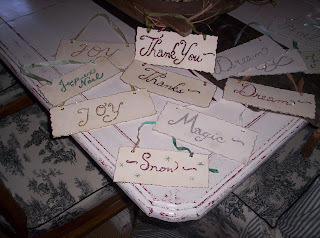 Hello to all of the Cottage Christmas decorators out there. 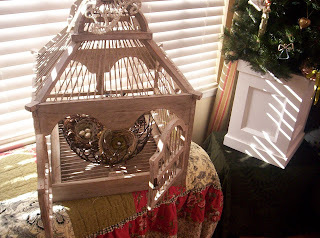 My friend Jennifer Grey of The Old Painted Cottage is having a wonderful Holiday contest!!!! If you don't already know, she has a beautiful website and blog. She sells amazing pieces on her website. 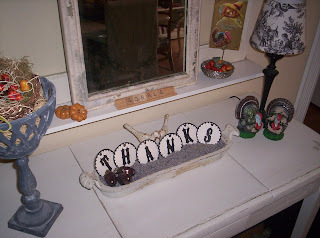 As you know I have been featured as The Cottage of the month, once in Sept. 2006, and most recently the Halloween cottage of the month this past October. If you want to have some fun, win prizes and be featured as the December Cottage of the month, here is what you need to do. 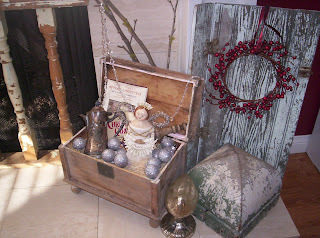 Go to www.theoldpaintedcottage.com Jennifer is looking for the best decorated Holiday Home! The winner of this contest will be fully featured in her upcoming "Dreaming of a Cottage Christmas" holiday issue of her December Cottage of the month page. (Very fun, by the way) The winner will also have a permanent placement in her Cottage of the Month archives book, and will receive gifts and prizes!! (Who doesn't want that)? 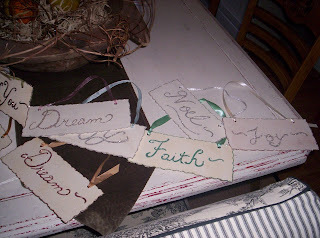 If you wish to post about this contest on your blog too, please email Jennifer at jennifer@theoldpaintedcottage.com and she will gladly send you the contest image and info. So please help Jennifer spread the word. (Fun, Games, Prizes, Pictures, Christmas) YAY!!!!!! All entries must be received by midnight, November 28Th. 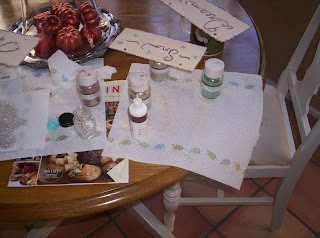 Winner to be announced on Jennifer's blog on November 30Th. As a previous featured Cottage of the month person, let me tell you it is so much fun to see your home featured on Jennifer's site. I would love to see some of your holiday homes, because you are all so talented and fun!! As you know from my previous post I have been working on signs, signs, and more signs. 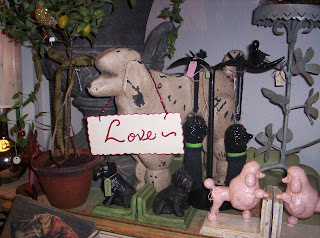 You have read about my favorite store in Ventura many times (Garden Memories). Barbara the owner saw a little sign that I made in one of my daughter's wedding photos. 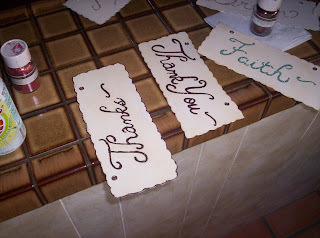 It said Thank You, in brown glitter. She asked me to make some for her shop. I was thrilled to do it. I also made some really cute cones. So all last week I was worried about, would she like the signs? Would she really want them for her store? Would she even like the cones? I brought them into the store yesterday. I thought maybe she would take a couple of each to try them out, but she took all I had. About 13 signs and 6 cones. I left them with her, went to eat lunch with my husband. 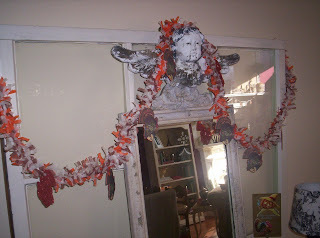 When we came back, she had Incorporated them in her shop and they looked beautiful. I was so excited to see my art in an actual store. Today I have started making more. When I finish these I will try to remember to take more pictures. 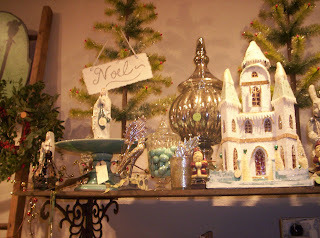 If you want to see Barbara's website, it's www.gardenmemoriesgifts.com. Hope you are all having a great Monday!! I think that is my longest title to date. In the previous post I was making a mess with the glitter and glue. Now here are the finished products. I hope you like them. So as I was cleaning my house this afternoon, a package arrived at my door. It was from Jen of The Cottage Nest. 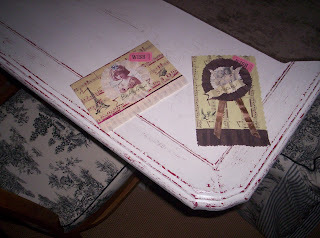 http://thecottagenest.blogspot.com/ We are participating in a scrappy swap. 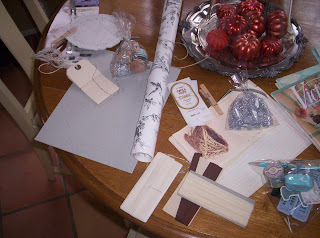 (Things you could use to make things, like buttons, stickers, fabric, paper, letters, book pages etc. Now here is the cool thing. We sent a package to one person, and received a package from another. That way you got to meet twice as many people and make new blog friends. I got all of this great stuff from Jen. Thank you so much Jen, it's amazing. I will have so much fun creating with all of this. You are the nicest. She took such care in sending me just the right stuff. I love the black and white toile paper. I am going to make something right away with that. 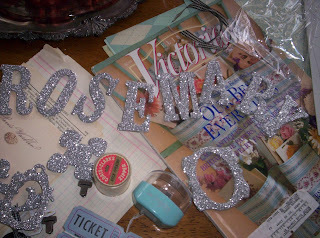 She even sent me my name in glittery letters. 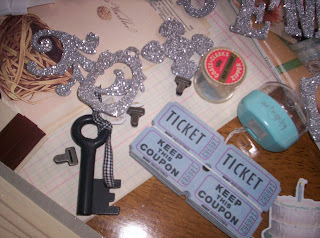 Some tickets, buttons, a Victoria Magazine, Papers and seam binding, tags and trinkets. How fun!!!! It made my day! I also had fun making a box of goodies for Cynthia in Texas. 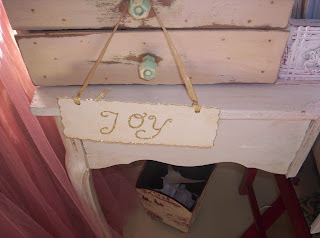 http://springmontcottage.blogspot.com/ I hope she likes it. 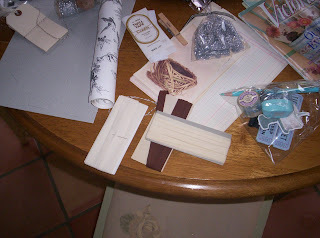 Now that I got through my daughter's wedding, I can do some projects for me. 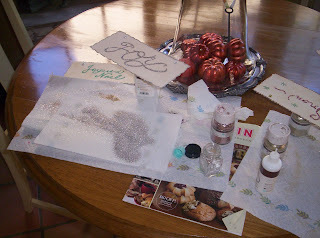 Today I started by making a huge mess with glitter. 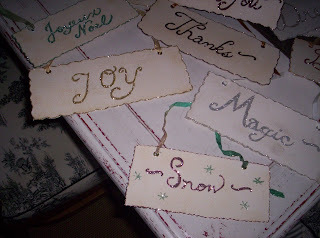 I am making some signs for the holidays. 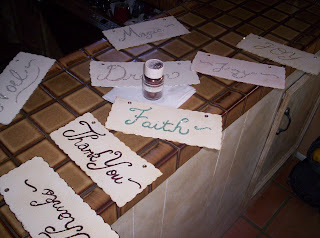 I was complemented on the signs that I made for the wedding, so I decided to make more. Lots of paint, pens, glitter, and glue. 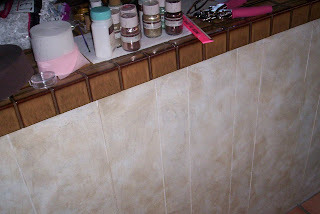 While waiting for the glue to dry, I thought I would blog about it. The wedding was really fun, but hectic and stressful. Doing projects for myself is so much more relaxing. I also made some homemade pizza dough for dinner. My daughter keeps calling from Italy, and is talking so much about the pizza that I had to make some. They are having a wonderful time. They will arrive home on Saturday from their Italian honeymoon. Here are more pictures of my mess. I will post the finished projects soon. Hope you are having a fabulous day/evening!!! Yesterday I spent the day packing away my Halloween extravaganza. As you know, I have a ton of decorations. 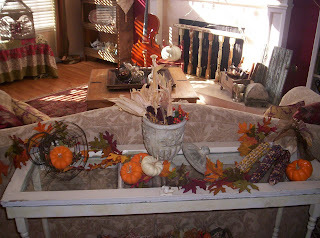 Today I spent the day cleaning, and getting the Thanksgiving decorations out. I thought you might like to see some. I have several vintage turkeys. 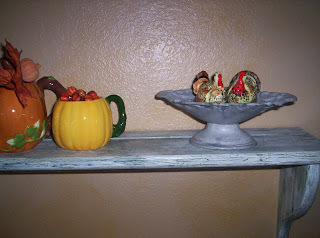 I also have a variety of Turkey Day decor. I hope you like what I have put up so far. It took me most of today, but I love doing it. It's fun to see what you have hidden away from year to year. 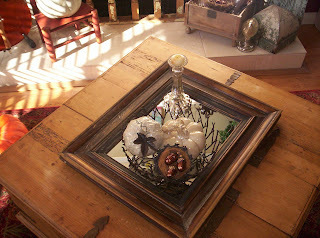 I also want to mention that my friend Barbara from Garden Memories in Ventura, has a new website. 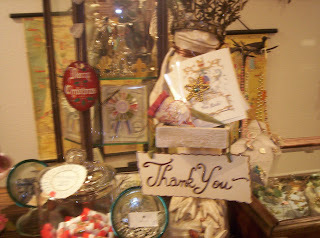 www.gardenmemoriesgifts.com. You have read about the wonderful things that I buy in her shop. You can also see her shop in a previous post of mine. If you are ever in Ventura California, her shop is a must!! !